Your pet rat would love a cage with as much room as possible. If you can't find the right cage for your pet rat, do it yourself with wire shelving and zip ties. You may need to experiment a bit with shelf options. The instruction for this cage uses just one shelf, but you can make the cage as tall as you want with as many shelves as you want. Start by acquiring the materials and tools you need to make the cage. You'll also need to have some decent tools, especially a saw capable of cutting the wire shelving. A power saw is recommended, as some of the wires can be pretty thick and this is the most difficult and time-consuming part of the construction, as is a good pair of scissors for trimming the cable ties. Cut three of the shelves in half with the power saw, if the hardware store didn't do it already. You now have six lengths of shelving, each of which is 3 feet long. Each shelf piece has one long edge which is bent, and one long edge that is flat. Turn the shelves on their ends, and the use the zip ties to join the long edges to form the main body of the cage. Use two pieces each for the front and back, and one piece for each side. The bent sides of each shelf meet at the corners. Use your saw to cut the J-channel at a 45-degree angle to meet at the corners of the top of the cage. The cuts won't be perfect, but it will cover any cut ends of the shelving and give the top rim of the cage a finished look. It also clamps on tightly and stabilizes the front and back panel of the cage. 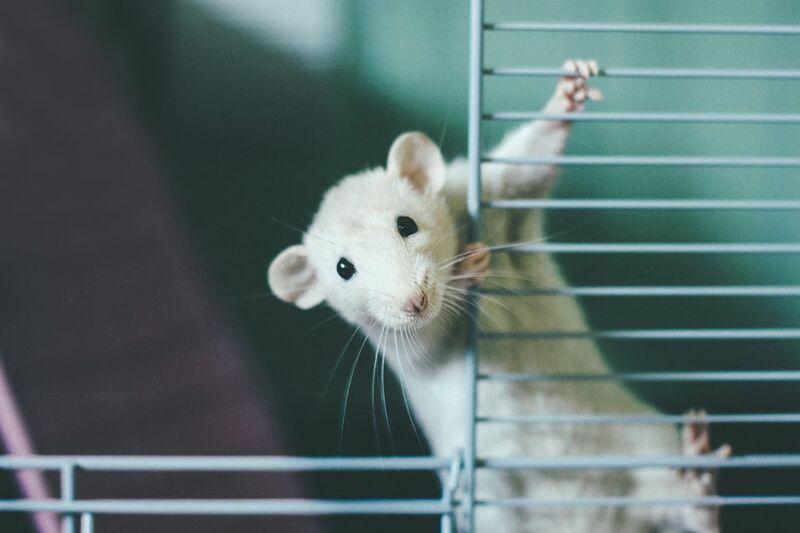 A standard door size for a rat cage is 9 inches tall by 5.5 inches wide. Cut doors from one of the remaining half shelves, making them slightly larger than the opening so that the door overlaps the opening a bit. Cut on the outside edge of the supports, so the door is a bit wider than the opening and make the door up to a couple of inches taller than the opening. Line up the bottom edge of the door with the bottom of the door opening. The "flat" side of the door—opposite the side where the support bars sit—should face in, allowing the door to sit nice and flat against the cage, so there are no spaces. Using several cable ties, attach the bottom wire of the door to the lower edge of the opening. You can also add a couple of metal clips in case your rats decide to chew off the zip ties. The doors are latched with simple bolt snaps, like the clips often found at the end of dog leashes, which can usually be found at hardware stores. The other remaining 3-foot length of shelving is used for the roof. Place it on top, with the bent edge facing up. Use several zip ties to hinge the roof to the back of the cage. Metal clips or hooks could also be used to fashion some roof lock for the front. The second level is made from a piece of shelving covered in plastic canvas. Cut a section of the shelving the same width as the cage. Attach the shelf using zip ties and then attach a piece of plastic canvas to the top of the shelf, also using zip ties. You can place a bird ladder in the cage for your rats to climb to the second level or they can use the sides of the cage. Place the cage on the under-bed storage container. Add food bowls, water bottles, toys, and bedding to complete your rat's new home.